RICE SUPPORTS TWO STATE SOLUTION… QUESTION IS WHICH TWO STATES? So far, these are the developements (italics are from THIS Ynet article)…. 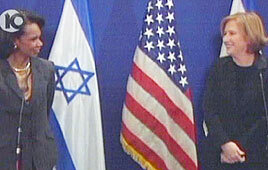 US Secretary of State Condoleezza Rice emphasized the importance of recognizing international agreements regarding a two-state solution, at a Jerusalem press conference following her meeting with Foreign Minister Tzipi Livni, and expressed optimism about her upcoming meeting with Prime Minister Ehud Olmert and Palestinian President Mahmoud Abbas. There would be more reason for optimism if representatives of Hamas were present at the scheduled meeting. The international community meaning the USA, Britain and France basically…. An official in Prime Minister Ehud Olmert’s office said that US President George Bush had agreed, in a Friday telephone call between the two leaders, to shun a Palestinian unity government unless it met these preconditions. The statement was not confirmed by US officials. And Israel has no preconditions to meet? Rice did not make any similar statement about a White House decision, although she did emphasize the importance of US and Quartet demands that a Palestinian government to recognize Israel and former treaties with it. But Israel does not have to recognise the Unity Government of the Palestinian Authority? “It only makes sense that you have to renounce violence, it only makes sense that you have to recognize the right of your partner to exist and to respect international agreements. Nonetheless, Rice said she is reserving judgment on the new Palestinian government. “There’s a difference between the announcement of the intention to form a government and the actual formation of that government,” she said. There is also a difference of being elected President of the United States and rigging the results so it appears you won….. ooooops… did I say that?? Abraham Lincoln said the following…. he must of had visions of what the future administrations would be like… “You can fool some of the people all of the time, and all of the people some of the time, but you can not fool all of the people all of the time.” I can’t think of a more fitting quote at the moment. So yes, the US supports a two state solution… obviously the two states being the USA and Israel. lol indeed, as well as the other two states: denial and belligerency.